Envirotech leading manufacturer of Wooden acoustic Ceiling tiles | Wooden Acoustic Panels | perforated wooden tiles. 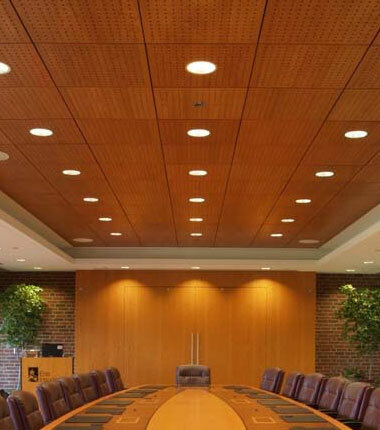 Envirotech Systems manufacturer wooden acoustic ceiling tiles, Wooden acoustic panels and perforated wooden tiles are available in different perforation patterns but we also offers designs as per clients / architect choice to give a different office look which will be different from that of a music hall. Envirotech wooden perforated tile control reverberations and give very good aesthetic look. Envirotech perforated wooden acoustic Ceiling tiles is installed as a lay-in tile in Grid T 24 / T15 / Silhouette T framework for suspended modular ceilings. Tiles can be easily dismantled for services work & reinstall. Auditorium , Multiplexes, , Home Theatre , Lecture Hall, Gymnasium, Library, Gymnasium, School, Hospital, , Shopping centre, Office building, IT Sector, Airports, Recording Studio, Hotels, Conference Hall, Educational, Lecturer Hall, Offices, etc.